Located at the southern tip of South America, the Patagonia region stretches across both Chile and Argentina. 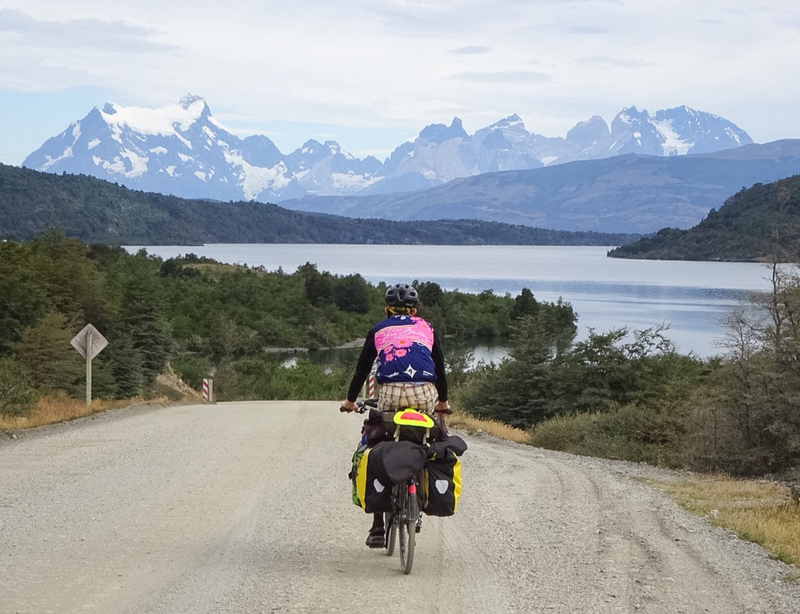 Within Patagonia, there are two popular cycling routes: Ruta 40 and Ruta 7. The first, Ruta 40, runs through Argentina. Because of its location on the east side of the Andes, the climate along this route is desert-like, and the terrain is, in my opinion, less-than-interesting. 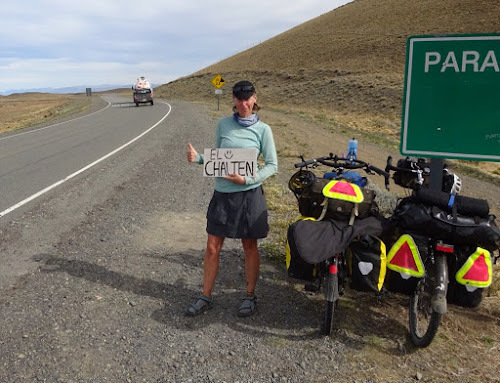 Ruta 7, on the other hand, runs through Chile. 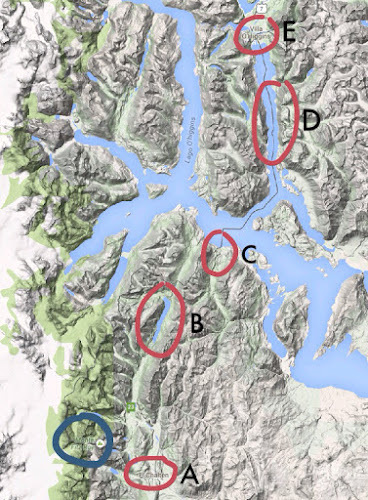 Because of its location on the west side of the Andes, the climate is more temperate, and the terrain is much more varied--think lush rainforests, glaciers, and fjords. Whenever you see gorgeous photos of Patagonia, chances are high that you are looking at the Chilean side of Patagonia. I wanted to see those gorgeous views with my own eyes, and for this reason, I chose to bike Ruta 7 through Patagonia. This gorgeous view, which is of the bridge crossing Río Mayer, is from the Chilean side of the Andes. Bikes, Ferries, and Views -- Oh My! We travelled from A to E.
Point A is El Chaltén, in Argentina. This town is where we left off with my last post, El Chaltén or Bust. Question: What do these three things have in common: backpackers, roadkills, and abandoned houses? Answer: All three have been common sights on our ride thus far through Patagonia. Backpackers have been a common sight as we've traveled through Patagonia. They are everywhere. We see them in towns drinking beers, in the backs of pickup trucks on their way to towns to drink beers, and by the side of the road with their thumbs held high seeking rides in the backs of pickup trucks on their way to towns to drink beers. Though we didn't actually hitchhike, I couldn't resist posing as a backpacker when I came across this "El Chaltén" sign. Roadkills have also been a common sight. If you know me well, you know that I am intrigued by roadkills. I have a morose fascination with lifeless animals that litter the roads. I enjoy attempting to determine precisly how the little critters lost their lives. I apply my paltry forensic skills to study the entrails, deducing the speed and angle at which the deceased was traveling, as well as the speed, make, model, and color of the vehicle that struck the deceased. It's weird. I know. Having stocked up with more than a week's worth of provisions, we set out on our ride towards Torres del Paine National Park. A mere fifteen or so kilometers outside of Puerto Natales, we said goodbye to the pavement and began riding on a well-maintained gravel road. The scenery was jaw-droppingly gorgeous. The view of glaciated peaks in the distance were like The Sirens, summoning us towards them with their entrancing beauty. El Mecánico rides towards Torres del Paine. For the first time on our trip, the riding was truly enjoyable -- the winds were manageable, as were the quality of the ripio ("gravel") roads. Having felt as though we had finally settled into a steady rhythm of traveling, we all agreed that the ride felt like a true bicycle tour. The theme of the last nine days has been Chilean towns that start with the letter "P": Porvenir, Punta Arenas, and Puerto Natales. 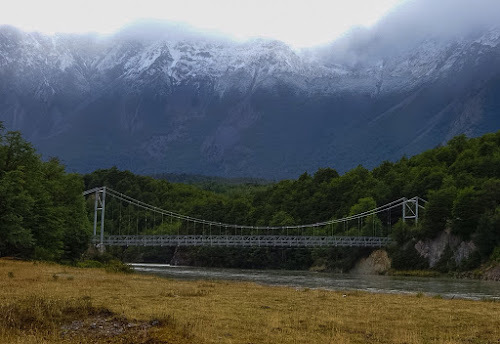 Having finished crossing Tierra del Fuego, we spent one night in a hotel in Porvenir, on the far west side of the island. The ferry that was to take us across the Straits of Magellan to Punta Arenas didn't operate the following day. Being the frugal tourists that we are, we spent the next night sleeping on the benches outside the ferry terminal. We were entertained by the longshoreman as they loaded large containers of fish onto ships. The precision with which they operated their forklifts was incredible! 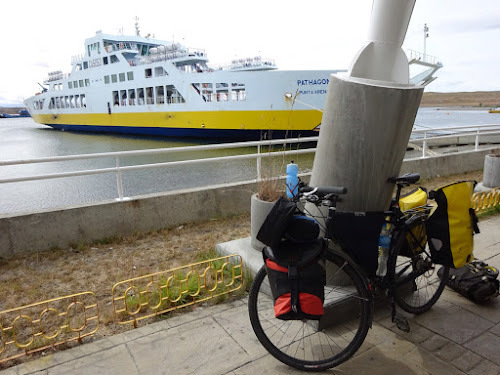 Later the next afternoon, we boarded the ferry for the twenty kilometer crossing across the straits. After hanging outside of the ferry terminal for nearly 24 hours, the ferry finally arrived. We spent the next two nights in Punta Arenas, on the mainland, to resupply and take care of some other need-to-dos. We camped in the yard at Hospedaje Independencia, where we were all super impressed by the owner, Eduardo. His hospitality went above-and-beyond and set a very high bar for our future hostel stays.